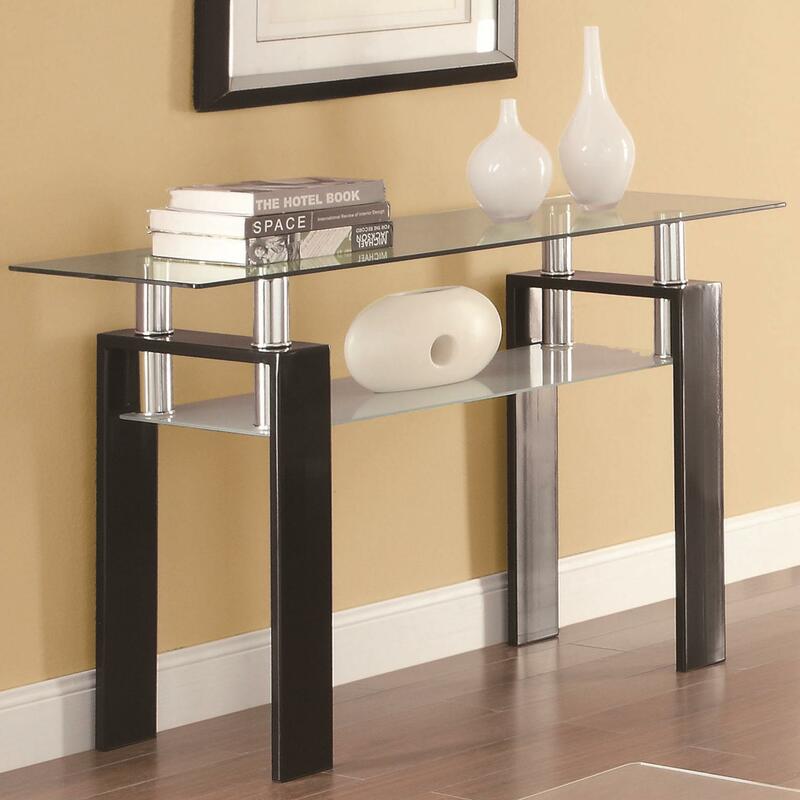 Add a contemporary feel to any living room with this glass sofa table. The glass surface is tempered, giving the table top extra strength. Highlighted by the wide, high gloss metal legs and floating table top look, this table also features a frosted glass shelf for extra storage space. The Occasional Group 702280 Tempered Glass Sofa Table by Coaster at A1 Furniture & Mattress in the Madison, WI area. Product availability may vary. Contact us for the most current availability on this product. 702289B2 Sofa Table Top 1 0" 0" 0"
702289B1 Sofa Table Base 1 0" 0" 0"
Stylish and contemporary, this occasional table group will liven up any living room setting. Wide, high gloss, black metal legs provide a very sleek and modern look to the tables, without taking away from the overall value of the tables. The floating table top look distinguishes the tables with unique value. The frosted glass storage shelf underneath the tables are an extra feature to provides functionality and style to the collection. The Occasional Group 702280 collection is a great option if you are looking for Contemporary furniture in the Madison, WI area. Browse other items in the Occasional Group 702280 collection from A1 Furniture & Mattress in the Madison, WI area.